Preserving fruit in alcohol has a transformative effect both on the fruit and on the alcohol. It is this type of preserving that I enjoy so much, taking an ingredient and seeing the result of preserving alter the taste, in most cases enhancing the flavour, the texture and colour. 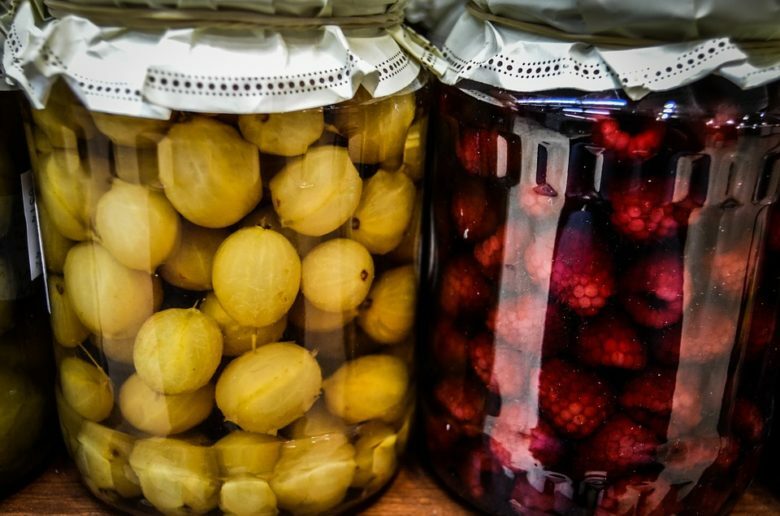 The great thing about preserving fruit in alcohol is you create a delicious fruit enhanced with the flavour of the alcohol you use to preserve it in but also the alcohol takes on the flavour of the fruit creating a delicious liqueur that you can use to make drinks, cocktails or aperitifs. Fruit has a long history of being preserved in alcohol, in the 18th century some fruits such as peaches, apricots and cherries simply went by the name “brandy fruits” served as a dessert after a meal. 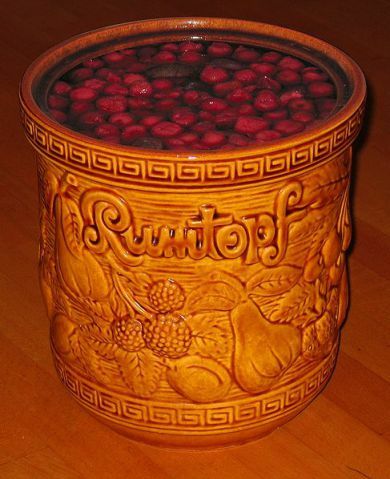 Rumtopf is a centuries old German tradition of preserving various fruits in rum at a time where a glut of fruit would spoil if not preserved. The fruit was added to crocks with sugar and rum and was stored from summer until winter when the fruit could be eaten over the Christmas period when fresh fruit was not plentiful. Alcohol is a natural preservative, it not only inhibits bacterial growth but actively kills bacteria, yeast and fungus in high enough doses. This is evident if you have ever used a hand sanitiser to disinfect your hands. The active ingredient in the hand sanitiser is alcohol, around 60% – 90% in strength. Alcohol acts as a preservative by denaturing proteins and dissolving the membranes of cells. In these conditions bacteria which are surrounded by these lipid membranes cannot survive. 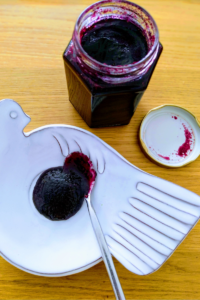 When we use alcohol to preserve fruit we clearly don’t want to use alcohol that is too strong, our main concerns are keeping the fruit from spoiling and making sure it tastes nice too. Most shops bought spirits are more than strong enough to preserve fruit; brandy, whisky, gin and vodka at around 40% alcohol by volume have the perfect balance of preserving power as well as flavour especially when combined with the fruit. Something very special happens when you preserve fruit in alcohol, the alcohol is a solvent. This means it extracts the aromatic compounds from the fruit and the skins of the fruit. Those aromatic compounds are where all the flavour is. There are many famous liqueurs made in this way, limoncello being a notable example where the solvent action of the alcohol strips the aroma from lemon zest to produce the wonderful tasting digestif. In a fruit like an orange, when you preserve this in brandy you will find the brandy takes on the flavour of the orange to create a beautiful liqueur and each segment of orange is pleasantly boozy with the brandy. All the flavours mingle and combine to create something delicious. You get to enjoy the preserve twice, once in eating the orange and twice by drinking the liqueur. Sugar has an important role to play when preserving fruit in alcohol. Sugar in itself is a preservative. 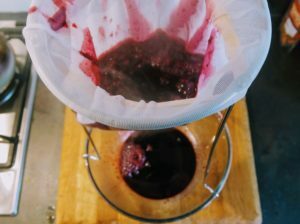 The way it works is to draw moisture out from the fruit, as this moisture is being drawn out in the presence of the alcohol a transition happens allowing the alcohol you are using to preserve the fruit in. Not only is this helpful for preserving but sugar, of course, enhances the flavour of the fruit and the alcohol as well. With three ingredients you can make a whole range of different varieties of alcohol preserved fruit. All you need to do is switch out the spirit you are using vodka, gin, brandy, rum and then the fruit; plums, strawberries, cherries, oranges and you can make a whole variety of different preserved fruits in alcohol. 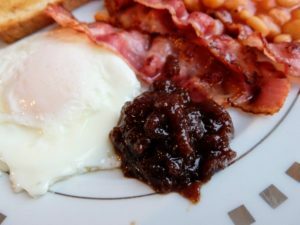 After this there is a whole range of other flavours you can start introducing if you use things like spices on top of the fruit which adds another layer of flavour. 2. 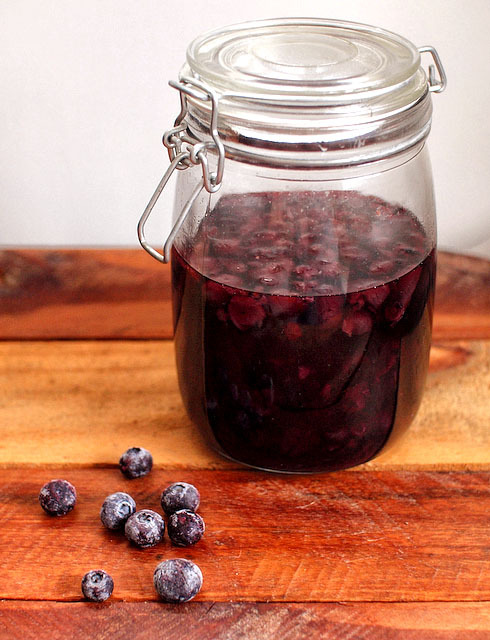 In a clean, sterilised jar add the blueberries and the cooled sugar syrup. Add the whole vanilla pod and then pour over the vodka so all the fruit is completely covered. 3. Give everything a good stir or gentle shake and seal. The jar is best kept sealed in a cupboard for around 2 – 3 months. 4. The blueberries are great when added on top of ice cream or added to cake mixes. The blueberries will last as long as they are covered by the alcohol. The spiced vodka makes a great digestif and can be used in all sorts of cocktails. This recipe is just the tip of the iceberg here. Try experimenting with some different combinations and you will see just how easy it is to make some absolutely delicious preserved fruits.